A QUICK BROWSE through the urban media this past month will unfortunately tell you that conventional farming is not only the reason we’re fat, but it’s also the big bad cause behind climate change and water pollution. One article is easy to overlook as utter lunacy, but when it is printed by Canada’s largest daily newspaper as a piece of an eight part series, there is cause for concern. With articles so blatantly sensational gaining a stronger foothold in the urban media, it’s important that farmers take note. The rise in recent one-sided food articles guised as journalism can be attributed to the gaining momentum of the “pro food movement.” The movement is gaining steam through online social media sites like Twitter and Facebook. A simple online search for “pro food” reveals that the movement is essentially a collision of several different trends associated with food and agriculture. Because the trend is arguably still in its infancy, there is no agreed upon definition for what it means. Those adhering to its concept are often in support of organic, local agriculture and a return to “slow food,” meaning a return to the days gone by where processed food wasn’t an option. The roots of this trend are often traced back to the 2006 bestseller The Omnivore’s Dillemna by Michael Pollan. The book asks tough questions about our food supply through an examination of what it is we eat. The criticisms of modern agriculture keep coming in movies like Food, Inc. and Pollan’s other book, In Defense of Food, published in 2008. Fortunately, agriculture is not taking these criticisms lying down. The Toronto Star article written by Margaret Webb elicited several responses from the farm community. 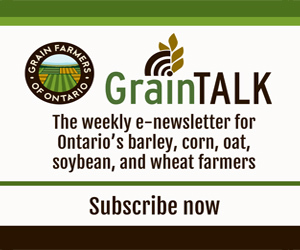 Letters to the editor from Barry Senft, CEO of Grain Farmers of Ontario and George Cornelissen, a farmer from Watford Ontario, cleared up some misinformation that the article touted as fact. Farmers and farm advocates are also making themselves heard in the online community as well through blog posts, Facebook pages and a presence on social media sites like Twitter. In addition to recognizing the detriment such negative half truths can have on our industry, it’s also important to look on the bright side. All of this focus on food and farming shows that the non-farm public is interested in what we do. More than ever, people want to know where their food comes from and they are willing to listen.